On any given night in the NBA, the most important focus is on the game itself. There’s rarely any future implications on games, especially in December. Then there are those teams that know, barring injury, that they are good enough to be at or near the top of their conference when the season ends. Those handful of teams know that not only do they have to build a resume of winning basketball, but they also have to beat the teams they are battling for seeding. This is where the Oklahoma City Thunder and San Antonio Spurs find themselves. To most, this is just a game in December. But to these two team, they know this game may have further reaching implications for late May and into June. The Thunder won the first meeting between these two team 94-88. This will be the 2nd of 4 meetings between the two teams. In the first meeting, the Thunder outscored the Spurs by 10 in the 3rd quarter to turn a halftime deficit into a lead heading into the 4th quarter, and never looked back. Kevin Durant and Reggie Jackson led the way, with 24 and 23 points, respectively, while the Spurs had more of a balanced attack with 8 players scoring at least 6 points. The Spurs come into the game 1/2 a game behind the Thunder with a 21-5 record. As is usually the case with this team, they are at or near the top of the league in points per game, assists per game, and opponent’s points per game. They run one of the better systems in the league and have the right players for that system. The offense is led by PG Tony Parker, who is day to day with a shin injury. Danny Green and Kawhi Leonard are dangerous at the wings, as Green is a 3-point specialist and Leonard is great at slashing to the basket. 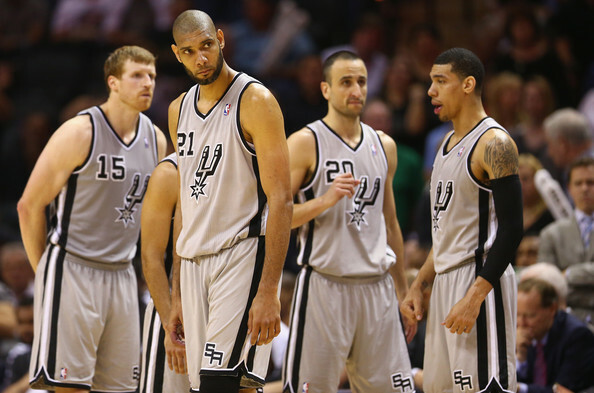 Up front, Tim Duncan may be showing signs of aging, but still requires attention from opponents. The bench is one of the more veteran-laden in the league led by Manu Ginobili, Boris Diaw, Marco Bellineli, and Patty Mills. 1. 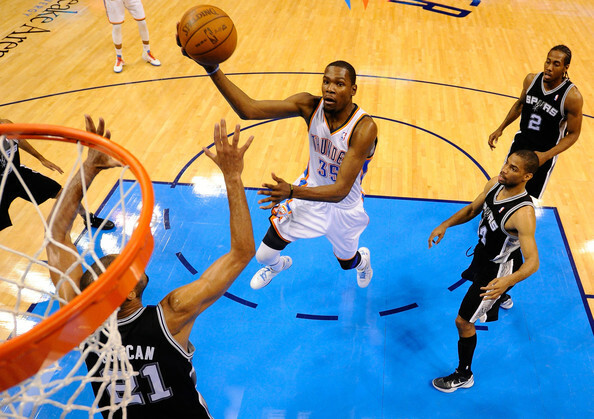 Pace – In the last 2 seasons, the Thunder have shown the ability to “out-athleticize” the Spurs. With Westbrook and Jackson pushing the tempo throughout the game, the Spurs have no answers for the speed that the Thunder play with. 2. 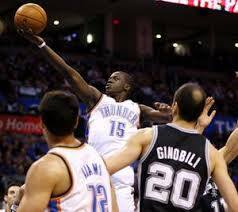 Kevin Durant – With Kawhi Leonard out due to a dental procedure, the task of guarding Durant will fall on Belinelli and Ginobili. Durant’s eyes and smile just got bigger. 3. Remember May and June – With one already in the bag, securing another victory over a top Western Conference contender will do wonders for the team moving forward. If the Thunder are able to win the season series versus the top teams in the West, that will only help them in hopefully securing home court advantage throughout the playoffs.